League of Legends introduced Aatrox, the Darkin Blade, way back in 2013. Since then, the mysteries of the Darkin have mostly laid untouched. Here’s what we know: Aatrox is an avatar of war who shows up and turns desperate folk into ferocious, bloodthirsty fighters. There are four more Darkins hanging around somewhere, and fans have speculated about who they could be. Varus and Jax seemed the most likely suspects, but as no new information was released, the rumours died down. Well, we finally meet our new Darkin, and he comes with a whole lot of baggage. Kayn and Rhaast are a unique duo champion coming to the rift. They’re not like Xayah and Rakan, two separate champions—but they do have a unique transformation mechanic that makes them almost two champions in one. Kayn’s a weird champion, with a lot of connections and mechanics, so let’s dive into the good stuff. Shieda Kayn is a member of the Order of Shadows, which is Zed’s dark ninja order. He trained with Shen, until the Order split; Kayn sided with Zed, and has been training under him since then. He’s a big fan of Zed’s approach, but he decided that he could kick things up a notch, and found a weapon. That weapon was Rhaast, the Darkin Scythe. The two are now locked in a battle for control. Turns out that the Darkins are weapons, and they take over their wielders. Aatrox, the Darkin of War, won that battle a long time ago. We learn that Varus is a Darkin who’s losing the war to his bow. Finally, there’s Kayn. Kayn is fighting Rhaast, and he seems to have a pretty good shot at winning. Both of these champions are the edgiest additions to League’s roster yet, and they’re all in one package. Kayn starts out mid-struggle; Rhaast has taken over his arm and part of his chest, and has his own set of lines that work in sync with Kayn’s. As they work together to collect souls and murder other champions, they unlock one of two paths, which give Kayn a different kit. Here’s how Kayn works: his passive, the Darkin Scythe, unlocks after he’s collected enough souls. It grants him access to one of two kits. If he chooses the Shadow Assassin path, Kayn wins out and becomes a slippery, mobile assassin who gets into the backlines and hunts down carries. 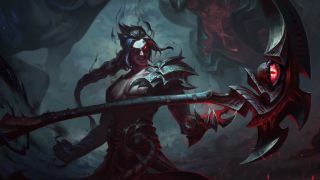 If Rhaast wins, Kayn is submerged and Rhaast shows up in full Darken form to dish out damage. Kayn has three models to reflect these various changes, and a ton of voice lines. If Kayn wins, he gets bonus magic damage during the first few seconds of a fight. If Rhaast wins, he gets passive spell vamp on his abilities. W: Blade’s Reach: Kayn does damage in a line, similar to a much faster Vel’koz W, and slows all enemies hit. If you choose Shadow Assassin, Kayn can move and attack after casting W; he leaves a shadow behind that casts it for him, with a little extra range. If Rhaast wins out, W has a knockup. E: Shadow Step: Forget the demons and possession, this is the most terrifying part of Kayn’s kit. He can stealth-walk through walls, like a one man Bard Magical Journey, and pop out of nowhere. Walking through walls heals him; he can Shadow Step away from walls, but the stealth doesn’t last for very long, and it’s a less effective escape. Shadow Assassin buffs this form up, giving Kayn movement speed and immunity to slows. R: Umbral Tresspass: Kayn’s ult gives him even more ganking power. He infests a champion, going invulnerable and going along with them. If the infested champion teleports, flashes, Tahm Kench ults, or moves in any way, Kayn is still there, infesting them. (He can end the infection early if he doesn’t want to take a teleport trip into the enemy team.) Kayn then pops out, like a gruesome jack in the box, and deals a burst of damage. If you’re a Shadow Assassin, you can pop into enemies from farther away, and your passive resets when you pop out of them, giving you a burst of extra damage after you re-enter the fray. If you’re a Darkin, the ult is beefed up with extra damage based on the victim’s maximum health. Kayn gives us insight on two different factions: the Darkin and the Order of Shadows. The last time we heard from Zed, he was aligning with Shen for a temporary alliance with the goal of hunting down the serial killer from their past, Jhin. Kayn, his apprentice, seems to be on pretty decent terms with Shen, but we probably won’t see him show up in that story. After all, his hands are pretty full. The Darkin are likely going to see an upgrade in the coming months. Aatrox is already on the to-do list, since he’s constantly faded out of relevance since his release. Varus is also showing his age, and if they want to re-design him down the road, the Darkin thing may provide a rich body of influence to pull from. I think we can all agree that Kayn, the Shadow Assassin, armed with the Darkin Scythe is pretty silly. But in League of Legends, a game with over 130 characters, Kayn will probably be making a lot of players who yearn for that kind of edge in their game very happy. The fact that his kit may shake up the jungle is the cherry on top.